Star Wars: The Old Republic will let players venture to the icy planet of Hoth. And nobody was surprised. 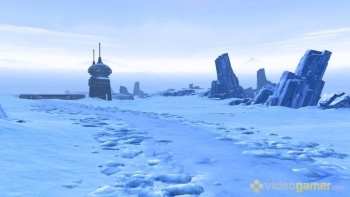 Videogamer has revealed that the snow planet of Hoth will be a visitable location in BioWare's upcoming Star Wars: The Old Republic MMOG. Now, it's true that Hoth - or more precisely, the Battle of Hoth from The Empire Strikes Back - has been featured in pretty much every Star Wars game ever by this point, so it's not too much of a surprise, is it? But given that the Hoth of SW: TOR is a good few thousand years or so before Janson took that Good Shot and the snowspeeders tripped up the AT-AT walkers, BioWare had some free reign to give its own history on the wampa-infested icelands. In The Old Republic, Hoth has no allegiance, no government, is contested by players from both factions, has frozen desolate wasteland terrain and is littered with wreckage from a major battle of what's called the Great War. According to Star Wars lore, Hoth was of no real interest to the Republic until it became the site of a devastating military defeat. At the height of the Great War, Republic and Imperial fleets clashed in the Hoth system in a decisive battle which saw the destruction of some of the most advanced and powerful starships in the galaxy. In the aftermath of the battle, Hoth became a massive starship graveyard, littered with the wreckage of hundreds of warships from both sides, including several prototype ships the Republic had deployed in the hope of turning the tide of the war. As the war raged on, though, neither the Republic nor the Empire had the time and resources to mount a recovery operation. Both Empire and Republic are interested in salvaging the wreckage of their fleets, and so Hoth has become a bitterly contested territory - a hot war in the middle of a very cold place, if you will. Don't forget, the odds of surviving an unprotected night out on Hoth are approximately seven hundred seventy-five ... to one. Better bring a Tauntaun to slice open. Check out screens and artwork at the Videogamer reveal.